This is Heinemann’s fortieth anniversary. 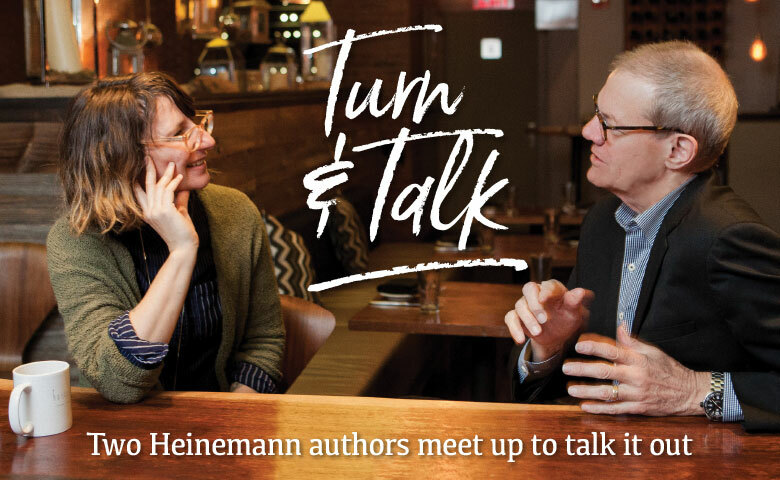 As part of the celebration, we are introducing a new feature series, “Turn & Talk: Two Heinemann authors meet up to talk it out.” In this series, we will convene two writers, one from the earlier generation of Heinemann authors and the other representing our newest cohort of authors, for conversations on a variety of topics. An excerpt of our first exchange, between Harvey “Smokey” Daniels and Kristi Mraz, is printed in our current PD Catalog-Journal, and the full, unabridged transcript is featured below. Join author and editor Ellin Oliver Keene as she moderates this timely discussion that explores the source of writer identity, the challenges of teaching during unsettled times, equity issues in schools, and more. Additional “Turn & Talk” conversations, facilitated by Ellin, will be published on the Heinemann blog throughout Heinemann’s fortieth year, enabling our readers to immerse themselves in the most critical topics in education around the world from the perspectives of two deeply respected authors with very different backgrounds. Ellin: In all of the identities that you have as parents and partners and spouses and professional developers and teachers, how did you develop a writing identity? How did you come to be writers, to feel like writers? What influenced your development as writers? Kristi: I grew up in Western New York outside Rochester, and the schools were early adopters of writer’s workshop. My first memory of writing is third grade. In a writer’s workshop, I wrote a story called “Look What I Found,” which was about a chicken bone I found in an archaeological experiment. I remember our teacher bound it in wallpaper and put a hard cover on it, and I was like “Nailed it, nailed it.” That was the first time I felt like a writer, and I remember incidents throughout my elementary school experience. I remember a story I’d written about turning into a giraffe, and my fifth-grade teacher wrote, “Why so many parentheses?” Which, by the way, I think is a note we’ve gotten from our Heinemann editors! I really thought of myself as a writer in elementary school, and then in middle school and high school—nothing. College—nothing. I lost it a little. I always wanted to revisit that part of me, but it was only in the past five years that I’ve reacquainted myself with that feeling. Smokey: My story is so different. I went to school in the ’50s, so writing workshop didn’t exist. Elementary writing was just penmanship, worksheets, and a report on a state that you didn’t care about in fourth grade! Literacy instruction was mostly about reading, and when we moved on to high school, it was teachers lecturing us about what great books meant. So, I fell in love with writing in spite of school. I played around with writing as a kid, wrote notes, cartoons, and little neighborhood newspapers, and later comical scandal sheets for my friends. Then I went to journalism school at Northwestern. I wanted to be an investigative reporter, but journalism school was just who/what/where/when. Classes were very rigid, and there was no creativity in it. I transferred immediately to creative writing in the English department. Looking back, I would call myself a naive and slavish Hemingway imitator, basically. But I won lots of awards and scholarships and that gave me a great boost as a writer. Ellin: Do you still have those stories? Smokey: I have them, yeah, yeah. They’re terrible. Ellin: Do you write creatively? Smokey: Never. When I try to write fiction, I just laugh at myself. “Ha! Smokey’s trying to write a story; this is hilarious!” I can’t take myself seriously as a fiction writer at all so I am in awe of people who do it. Kristi: I have always used writing as a way out of mental turmoil and questions. It’s like an untangling process. Because of my love of creative writing, I feel like I’m coming from a slightly different angle; trying to write professionally in that way was a hot mess. I learned to write through feedback and practice . . . lots of practice. Ellin: But you had to cognitively talk yourself into believing “I’m a writer” to feel like a writer. Kristi: I still don’t; professionally it still feels a bit like I’m pretending. Smokey: But that’s how people learn anything—by pretending. There are kids pretending to read, kids pretending to write. We pretend our way into anything. Smokey: This thing in the culture that being a writer is a big deal, that it’s a talent, is pretty much a total lie. It’s something you can learn how to do well if you do it enough, but authors get celebrated into this mythology, which makes a lot of people so fearful of doing it. Ellin: No matter what your political views, it feels like we are in an unsettled time in education as well. When adults are unsettled, distracted, fearful, or angry, those emotions can filter out to the children. I worry that those feelings are manifesting in our teaching, affecting our kids. What can teachers do to keep our focus on the kids while assuming roles of advocates and active citizens? Smokey: It’s an especially disturbing time, and Sara Ahmed and I have written about this. We’ve talked about how the world hands you a curriculum, whether you’re sitting in your kindergarten class or your freshman English class. When you teach, when you’re with kids for 180 days a year, something always is happening: a class pet dies, a fire in the neighborhood, someone’s grandma passes away. These things happen and come through the door with the kids, so we’ve always had to figure out how to deal with unsettledness as maybe just part of the human condition. Our job as teachers isn’t to make it seem like the world is completely safe and happy all the time, but to have the skills to confront trouble when it comes and to learn about it and to have agency and power. Kristi: It’s my responsibility along with everything else. I didn’t get hired to have no filter. My job is to make kids feel like they can make a better world and so that’s what I’m trying to do. Smokey: There has to be a way for you to tell them that they’re safe with you now and that there are so many grown-ups working to solve this problem—whether it’s an earthquake, or a tsunami, or a war breaking out—whatever it is. I think that is really important to be able to tell them about some of the helpers and the heroes that are out there. Ellin: I worked in many districts serving primarily children of color and teachers were mostly white. I’d love your thoughts about how, as a nation—not at the school level or individual classroom level, but as a nation—we should approach this issue. What needs to change to not only attract people of color into teaching, but help them feel comfortable enough to stay? What can educators do to address this dilemma? Smokey: When I was a young teacher in the Chicago Public Schools, so many of my colleagues were people of color. Now, young black and Hispanic folks can choose from a wider variety of careers than were open to them in the past. We have to address this “minority teacher flight” through our professional organizations like NEA, AFT, NCTE, and ILA. Any organization is always better when it is diverse. When it’s genuinely diverse, we’re smarter. We come up with better ideas. We have more energy. It’s just in sync. Kristi: I think one thing to name straight off the bat is that we’re three white people having this conversation, which is the problem. So if I am the one at the table, I need to amplify other voices, other people who are doing really smart work around this like Val Brown, Christopher Emdin, Cornelius Minor, and organizations like Border Crossers. Read them! We talk about picture books being windows, mirrors, and sliding doors, but professional books have to be that, too. Smokey: One of the greatest gifts that I’ve gotten over my career, working mostly with minority kids, is if you’re out there in that world, you’re going to get your head handed to you periodically. That’s the biggest thing I’ve ever learned about this stuff. Your intentions are irrelevant. What happened, happened. This is how it is. Go fix yourself. Kristi: We have to stop talking about intention. We have to start talking about impact. What’s really happening? Ellin: Back to the questions: Why do teachers of color leave in such huge numbers? What can we do to help stem that tide? And where does it start? Kristi: Teaching is hard. Sometimes it’s a lot of work to find joy, and that shouldn’t be, but when you start the day with a staff meeting . . . Sometimes when you walk in and you see kids’ faces, you’re like alright, let me bear down and smile. You know what I mean? And it is immeasurably harder when a system is stacked up against you. If I feel it’s a struggle, and I am the one with privilege, how hard is it for my colleague? She’s a teacher of color who has white kids in her class asking “Where are you from? No really, where you from?” People shorten or mispronounce her name. Addressing it starts with facing those issues as issues of race. Smokey: Yeah, for $35,000 a year or less. Kristi: Teachers are in a position where it can feel like we’re powerless. We can feel powerless about curriculum, powerless over school decisions. Power is a huge issue in the teaching profession. What do people who feel powerless do? They try to take power. Power is a huge issue in the teaching profession. Smokey: I think teachers of color rightly worry about whether they will be seriously respected and listened to in school systems. To make teaching more attractive, faculties need to do the deep identity and empathy work that creates real trust and community. There is a blueprint for this in Sara Ahmed’s book, Being the Change. And teachers need to do this same work with kids. Kristi: One of the trickiest things about teaching is that there’s a caregiving aspect to it. The only parenting advice that I follow is that the best predictor of who your kid will be is who you are. I’ve taken that as a mission statement to be a better person. Ellin: We are fortunate to work in a professional community. We meet at conferences, we attend and provide professional development, and we engage in extraordinary conversation with other educators. We are lucky, but I wonder if our professional lives sometimes become an echo chamber. What’s the balance between collaborating with like-minded colleagues and engaging in conversations with those who have a different point of view? Kristi: I’ve been trying to follow people in my social media who are saying very different things than I often see in my feed. I just try to sit and learn. I’m working hard to make sure I’m hearing a variety of points of view about things. Smokey: I learned a helpful mental practice from literacy author Peter Elbow, who wrote about playing “the believing game” versus playing “the doubting game.” This means you intentionally try believing in an alien idea at first, instead of immediately rejecting it. So often, when someone is coming from the opposite side of an issue, we automatically begin by doubting. Soon, everything that comes out of his or her mouth is not worth consideration, it’s wrong, and we tune out. I’ve often found that purposefully playing the believing game helps to open my ears so I can really weigh others’ views. Of course, some ideas are so contrary to our deepest beliefs it’s impossible to put yourself into that the opposing mindset. Ellin: All of these questions are very complex with no easy answers. The people who should be asking the big questions are the people who are working with the kids. What questions do you think educators around the country should be asking of their administrators, of their community members, of each other? What questions should we be asking ourselves at this juncture? Smokey: Are we really extending the progressive education tradition, or are we turning back on it? I see a lot of signs in our publications, in our culture, in our research, that suggest to me that we’re going backward. Kristi: I don’t know that we do enough around our belief systems. What do we believe? And then how can I back my belief up with classroom evidence and curriculum evidence? What do we believe about kids? What do we believe about teaching and learning? Smokey: One of America’s school traditions is developmental, student-centered, discovery-based education. A competing model is often called the coverage, skills, or textbook approach. These paradigms have battled with each other for over a century, and if you’ve taught as long as I have, you’ve experienced some of those ups and downs. If people believe that kids basically tend toward the good and they’re perfectible creatures that have within them capacity for empathy and compassion, then you’re going to promote a very different kind of school system than if you believe that young people always tend toward wickedness and need strict control. Kristi: There’s a saying, something like, “The world is good and worth fighting for. I believe in the second half.” That’s a good summary of me at this moment. I don’t feel the world is all good, but it’s worth fighting for, and that’s what we’re doing in our classrooms. Smokey: You triggered me to think about another thing that worries me right now, which is the idea of grit, persistence. Kristi: Oh, me too. And I’ve got a good thing to say about this. Kristi: You might recall the marshmallow test. This was a real growth mindset thing for me. The marshmallow test is that torture for little kids where they are told they can have a marshmallow now or wait ten minutes and have two marshmallows. The researchers used that study to talk about the importance of grit. And they tried to link the kids who could wait as being more likely to have higher GPAs or whatever. There’s a second study that’s not as well known that I love. They first proved the marshmallow giver was either reliable or unreliable. Then they put the kids in the situation, and they found that more predictive of what kids would do with the marshmallow was the reliability or unreliability of the provider. And that’s so important to talk about: it’s not that you develop self-regulation this internal way, but your environment proves it to be worth or not worth developing. So much of what we put on kids—“Oh, they need more grit”; “They need more self-regulation”—isn’t about the kid. It’s about the environment we are setting up. I think about this all the time, and it helps me limit how many times I proved myself unreliable with my students. “You can do it after lunch.” “Five minutes and then it’ll be your turn.” If I don’t follow through on those claims, the kids remember. And then you think, this child needs to work on self-regulation. No, we need to work on reliability. Smokey: That was a really good thing to share with us here. You were right. Kristi: We also need to work on making school interesting because the curiosity research, such as it is, obviously shows that when we’re interested in something, we bring more self-regulatory skills into play. We work harder and persist longer. I told this story before. The moment I realized I’d come into my own as a teacher was the first or second day of school, kindergarten. I was just psyched that three quarters of the kids made it near me, and the other quarter were in the bathroom turning the faucet on and off, because that’s awesome. I was trying to launch writer’s workshop. I was telling the kids, “We can make books; it’s so awesome!” Writer’s workshop has always been high interest. And then a window washer dropped down right outside the window. This happens in New York City. All of a sudden one of the kids cried, “A window washer!” and they all ran to the window. Kristi: One year previously I would have said, “Please come sit down; eyes this way.” And instead I said, “Yeah, that’s awesome. Let’s open the window. Let’s talk to him.” They were following that curiosity. Taking that inquiry. That’s who we want them to be. Smokey: There are two ways to get more time for kids’ curiosity, kids’ inquiry, into the day. One way is to inquiry-ize the curriculum by asking them what they want to learn about. Community helpers in the first place. And the other way is scheduling protected time. Whatever you mean by a genius hour or wonder wall time. You’ve got to protect time. Label it, name it, save it. But the other way is that you’ve got to go for it. When the window washer comes down, what are you going to talk about? Or when it starts to snow. Of course they’re going to run to the window. Kristi: Get our math cubes out? It’s ridiculous. Ellin: Go, run for your life! Smokey: It was the funniest, most hilarious thing. But what are they doing? They spend the morning researching octopi. They find they’re good at sneaking out. They’re really smart. How he would have slid down the pipe. Ellin: Yes, we should drop our darn agenda and go with it. Smokey: And that says volumes about you and your playfulness and your spontaneity and your optimism. Ellin: So, it’s been great to meet up and talk with you both today. This is my last question. It’s Heinemann’s fortieth anniversary this year. I’m curious what Heinemann has meant to you as writers, readers, and professionals—what’s the influence been over the years? Kristi: Well, I’m a product of Heinemann to a certain extent since I had writer’s workshop in my classroom as a kid. My mom was a teacher, and when I joined the teaching profession, she gave me her first edition of Lucy Calkins’ The Art of Teaching Writing. Smokey: I wrote my first Heinemann book in the mid ’80s, and so I’ve been publishing there for more than thirty years. It’s been my professional home base in so many ways. Just the other day, I got out the Heinemann “mother text”—Donald Graves’ Writing: Teachers & Children at Work. I started reading the first page, and it’s just, oh man, this is so amazing. He was writing breakthrough stuff back then, but it feels so fresh and valuable to us even today.